1. Choose your plane/train/etc. outfit carefully. Yes, you might look a tad bulky. But we’ve got a secret for you: the bulkier you are, the comfier you are. Essentially, bulky can easily turn into a walking sleeping bag (just try not to infringe on your neighbors’ space). As annoying as it is to have to remove cumbersome shoes, wear your biggest pair on the plane to save space. Remember that you can remove layers if you get too hot, and use a bigger coat as a blanket if you need to cozy up. 2. Don’t be afraid to check a bag. There’s a big aversion to bag checking due to the extra fees it can often incur, and you wind up seeing some pretty insane carry on backpacks that make your back ache just by looking at them. As someone who values having certain securities and comforts, sometimes you have to make the decision between being cheap and being comfy. Personally, as someone who needs to stick to my daily routines, it’s worth it to me to pay a little extra to have the items that normalize my day to day even when I travel. 3. Maximize the use of your space - and get creative. 4. Don’t pack more than 3 pairs of shoes. Pretty straightforward, but my rule is: pack an active pair (hiking, running, etc. ), a fancy pair (heels), and sandals. That’s it. No more, no less. 5. Don’t bring whatever you can buy there. Now, obviously don’t go out and buy your whole wardrobe - this is more of just a comfort for those who can be a little forgetful. Odds are that you can pick up a toothbrush either at your destination, or even at the airport (though it might be a tad expensive). But what it’s easy to forget is that there is a whole way of life where you’re going that has all your needs figured out in their own way. Why not give their method a try? 6. Plan - and pack - ahead. 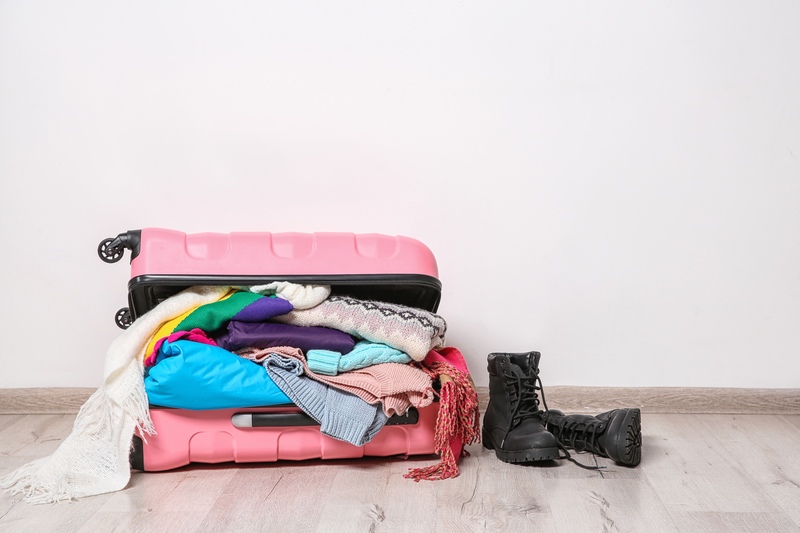 A lot of overpacking derives from a lack of time, a surplus of fear, and an even greater amount of tossing randoms into the suitcase in a frenzy. If you discipline yourself ahead of time, you might still have extra items that you don’t need on your list - BUT you’re much less likely to pack that random pair of suspenders you’ve never worn but miiiiight end up needing at some point. Create a packing list and stick to it as much as you can - and if it’s still too much, you can narrow it down from there. Grab that sweater that functions as a layer-up or even a layer-down. Invest in that leave-in conditioning spray that can function as a conditioner, heat protectant, AND styling aid. Consider a purse that's either small enough to fit in larger pockets, or one that's large enough to work as a carry-on. The truth is: your trip is temporary. Sometimes, you’re going to forget something that you feel very lost without. I challenge you to feel a little discomfort without your items and to seek creative solutions to what you miss - after all, sometimes the best experiences come from plans gone awry.